A ONE YEAR REVIEW OF 2013 UA OWNERSHIP FOUND HERE! At 35 weeks pregnant a road trip this past Sunday to Brooklyn was planned to test out some box bikes. We planned an early visit to Rolling Orange around opening at 10am. 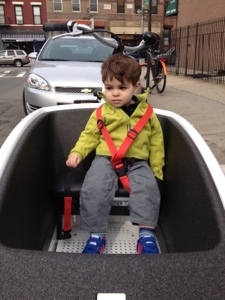 This was genius, the store was empty the street adjacent had parking and was fairly open to test out bikes and ultimately our toddler wasn't rowdy. When we walked back to our car later in the day the store was packed. So we felt grateful for the early morning visit. 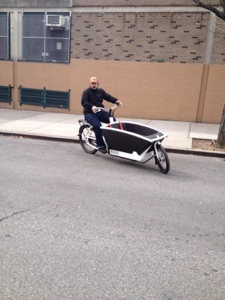 Rolling Orange currently carries four types of box bikes priced from as low as $1975 to $4000+. In price order they carry the Milano (Bakfiets), Gazelle Cabby, Bakfiets.nl (in both factory added e assist and none) & the new to the scene Urban Arrow. 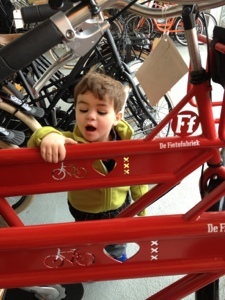 With a small store front and a lot of bikes they can only build up and have on the floor only one of each type of box bike at a time and they just sold the Milano and Bakfiets.nl so they could only show me pictures/quote prices/answer questions. So call ahead to make sure they have what you want to try. Although the Milano (built in EU) is priced as an accessible options to families seriously under 2k!! I have little interest in a non-assisted bike. 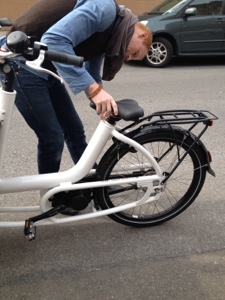 But I was a bit bummed they didn't have a Bakfiets.nl e-assist available to try. John, the very nice associate/manager who helped us at RO was excited that we wanted to try out the Urban Arrow as they literally just got them in that week. RO is currently the only stateside dealer of them, but we know Bill Clinton also has one! They do come fully assembled from overseas. The bike itself is beautiful, white frame with a black box. The box is made if some type of foam (almost like the interior of a helmet?!) I assume to make it lighter then a wood box. The walls are very thick. It is a waterproof material. But my husband was a bit worried if someone could easily damage to it with a sharp object (aaah city living). The floor of the box is metal and perforated so great for drainage. 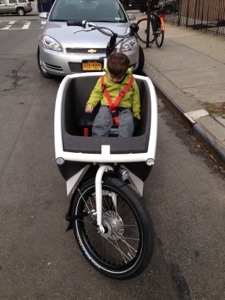 The box is smaller then a Bakfiets but bigger then a Bullitt, I think two kids could fit maybe three. It does come standard with one bench and two seatbelts for kids. The frame appeared very sturdy and thick. It comes standard with light of course and back rack. The brakes were disk (hand brakes only) great for us who climb hills and want to get safely back down! The pedal assist was very easy to use and could be shut off entirely. Unlike most bikes where the battery is under the back rack or frame mounted, the UA's is integrated in the pedal area. It was silent when turned on. The gears were also silent when they changed so that was very odd to get use to since our current bikes have exposed chains and loud gear changes. The frame is step through. Which honestly is a godsend when you are 5'3" at no point did I feel like it was too tall for me, a feeling I get on many bikes. The kickstand unlike the photos on UA's site is actually a 4point kickstand and felt incredibly sturdy. I did find the plastic fender on the rear a bit cheap. The seat was squishy and just felt okay to me, nothing to write home about. Maybe I would feel differently on a long ride. I sent my husband to test out the bike first since I was nervous about linkage steering. When he came back he said I should be fine because our Halsted although it does not have linkage steering rides similar, you cannot see the front wheel and the basket rack doesn't move so you just trust in your ability to turn a bike. I hopped on next at a billion weeks pregnant and what do you know I found it super easy to handle. The center of gravity was so low I never felt like I was going to dump it, a feeling I get all the time with the Halsted (a feeling that has grown worst since we mounted a back seat). 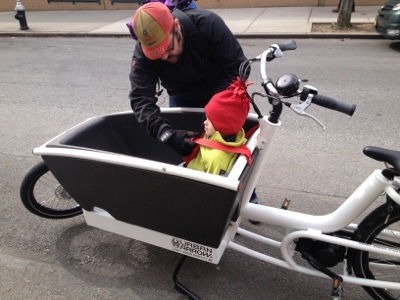 I now understand how parents can pile kids in a box bike and never worry about dumping, unlike bikes with seats mounting the kids in higher positions. There was a slight incline back to the bike shop. I turned the bike around mid incline while riding (helpful to understanding if this is the right bike for us since we live mid incline) at first I was a bit worried about getting the bike to go, but the second I pedaled the e-assist kicked in perfectly and I felt as light as I would be a tiny road bike. Just enough effort to be fun, and enough help to feel like I am beast! Finally, little guy was melting down that we were riding a bike without him. So my husband took him for a spin. And yes he has no helmet on I forgot to bring them! (Don't worry we didn't leave the quiet street with him so just pretend we are in Amsterdam and keep the you are killing your kid judgment to yourself). He had a big meltdown after we took him out so pretty sure he gave the bike a thumbs up! I will also say even though he is tall for his age his feet didn't hit the floor of the box yet. In summary, the Urban Arrow is a car. It felt like a pure luxury sedan and the price of course matches. If you want a car replacement like us you need to check out this bike. 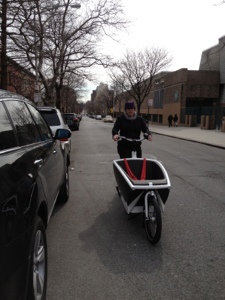 We have some more testing to do, probably back once more to Brooklyn to test out the bakfiets.nl but honestly it is going to hard to beat the Urban Arrow, not sure we should have tested this one first! We have not stopped talking about the bike yet. Also shout out to Rolling Orange, if you are in Brooklyn drop by! They have a great selection of bikes and accessories. They had superior knowledge and so helpful. Also they do rentals of batvaus personal messenger bikes and bike tours! This is fantastic! I had no idea that the Urban Arrow was really, truly available. How cool that you got to be the first people to try it! 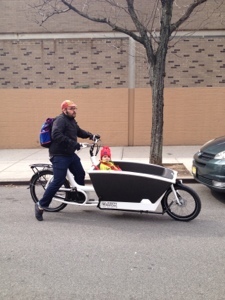 Also, we've never regretted spending a relative fortune on our box bike. I rode an Urban Arrow in Amsterdam at UA HQ. Fantastic! Glad you like it. 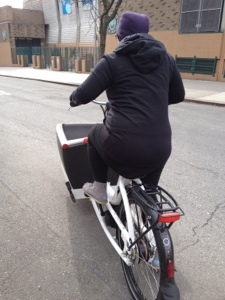 See Everytime I see a Bakfiets I do think my god they are tall but apparently lots of short people ride them. I did find out the unassisted bak is as heavy asthe assisted UA so that made me sway back towards the UA. Hi Dena, how is the Urban Arrow doing? Hope all is well. Things are going well! The bike has been great to ride even at 40 weeks preganant! We took it to a street festival this weekend and we could barely get away from the bike as we had people asking a trillion question! We are troubleshooting two small problems I was going to shoot you an email about them later today. 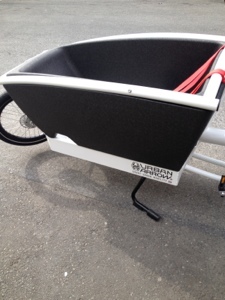 why don't you get a Christiania 2wheeler, it is a lot lighter, better components, motor in the rear wheel as it should be on cargobikes... sure you will love it when you try it. I would have loved to try it but i don't think there is any dealers for the 2 wheeler here let alone with an assist. I have yet to see one! One small thing. Are you sure the brakes are disk? I think I see in the specs only roller brakes and hydraulic roller brakes. I think what look like disk rotors are actually cooling fins for the rollers. Pretty sure you are right! When we initially looked I can't remember if he told me disk or "advanced" and i took that as disk. Dave, over at Firth&Wilson took the back brake apart on our bike though so if you were wondering more about them (assuming you guys are thinking of carrying them at G&O) I would say shoot him an email. This article help me . Thank your for sharing.